Tune in A vision strong (Whelan) A rock song about being strong in vision and courage, including an optional verse about women's empowerment. "The victims of oppression call to us to sing their song". Lyrics, sound sample and songbook. Good for teenagers. Tune In: Come O God and visit us sick we pray / Your abundant life (Brown) A joyful song "Lead us into your abundant life". Lyrics and sound sample. Tune In: The desert will spring to life / Making things new (Anderson). A catchy pop song. Great for kids, and excellent imagery. Sound sample, lyrics and songbook. Good for kids. BUC Song Project: At the centre of our lives we long for you (Brown) "Come sustain us all" Particularly good if you are celebrating communion this week. Tune In: Alive in me Catchy boppy pop song about God's spirit within us and within the world. Music sample, sound sample and lyrics here. Good for kids. TiS 421 Where the Spirit is there's freedom (Harling) Fun and good. Can be sung with the congregation in two halves singing each part, which is not too hard once they have the hang of singing it in unison. Good for kids Lyrics. *Iona (Common Ground) / CH257 Singing we gladly worship the Lord together (Traditional Guatemalan) This song has a simple and energetic chorus with a great rhythm, and sings of us "sowing seeds of peace and love" in a troubled world. Good for kids. TiS 547 / AHB 455 / AoV1-009 / NCH451 / CH465 / A&M595 / UMH451 / VU642 / WoV776 / ELW793 / HPP353 / GtG450 / PH339 / CP505 / CP(E) 386 / W&R502 / Cha595 / Srce70 / URW180 / 82Hml-488 / Lau970 / StF545 / MP051 Be thou my vision O Lord of my heart (8th century Irish) Most recent hymnals are fairly inclusive for this. Note that the High King phrase has been changed in some hymnals because it is masculine, but the hymn is based on an ancient story of St. Patrick refusing to follow the High King Logaire, and choosing instead the "High King of Heaven". Lyrics, tune and a little of the story. Oldy-but-a-goody. NCH495 / HPP443 / GtG761 / PH343 / W&R581 / Cha453 Called as partners in Christ's service (Beecher) A good song of commitment - particularly good if you are commisioning people to new roles this week, and good for any other service too. Sung to a standard tune (BEECHER). *CP517 / W&R503 O God your constant care and love (Lanier) Quite good words about God's presence with us through our lives. Sung to a standard hymn tune. Lyrics and tune sample. MV144 / SP&P073 Like a healing stream (Harding) Gentle folksy ballad with a lot of water imagery - healing stream, gentle rain, river strong and mighty sea. Would need to be introduced, but would catch on pretty quickly, I think. Sound sample, sheet music sample, and pdf for purchase. TiS 119 / AHB 40 / NCH012 / UMH152 / VU231 / HPP39 / GtG032 / PH288 / W&R31 / Cha064 / 82Hml-398 / Lau684 / StF107 / MP293 I sing the almighty power of God / We sing the mighty power of God(Watts) I really like this old hymn, especially sung to ELLACOMBE, but it can also be sung to FOREST GREEN. VU, NCH and Chalice have inclusive language, but other hymnals (like TiS and AHB, are not). Lyrics and tune sample. Oldy-but-a-goody. MV163 River running in you and me (Macdonald / Light) Terrific words with lots of river imagery, a song of the spirit, and of challenge when times are hard. If this is not familiar, just get a soloist to sing it while the congregation joins in the last line "River run deep, river run free". The verses are not metrical, so it will take more time to sing them with confidence. 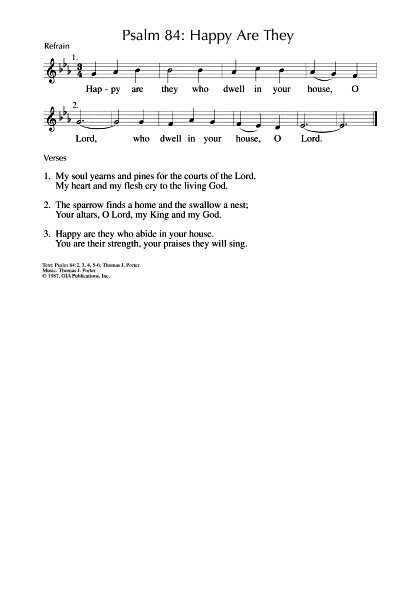 CH227 / PfAS065A The earth is yours O God (Saward) A simple hymn paraphrase of this Psalm. To the tune ROSSLEIGH. *ORAiY Dumiyah (Bruxvoort-Colligan) A simple chant-like refrain to encourage quiet reflection. Sound sample. Recorded Music Come One Come All (Malcolm Gordon) A delightful song of welcome "Come one, come all ot life that's whole; Come one, come all to love that's full". Sound sample and purchase options. *Emergent Psalter The fields are clothed with grain (Everett) A good quality sung refrain. The author also suggests using this Psalm as a grace. Nice idea. Sheet music sample (Click on "Downloads" tab). TiS474 / AoV1-012 / ATAR595 / CH623 / SFFS 2236 / HPP553 / A&M363 / GtG401 / G(II)539 / GC839 / GC(II)743 / G(3)848 / CP465 / W&R649 / Cha284 / SP175 / URW054 / Lau475 Here in this place new light is streaming / Gather us in (Haugen). Excellent words, very well known. “Nourish us well and teach us to fashion lives that are holy and hearts that are true”. Lyrics, sound samples, sheet music. TiS 647 / AoV2-012 / ATN 25 Comfort, comfort all my people (Mann) Easy to sing, beautiful lyrics. Chorus is “Comfort, comfort all my people, with the comfort of my word. Speak ye tender to my people, all your sins are taken away”. Lyrics, mp3 sample. Online Resource The River of God (Bruxvoort-Colligan) A call and response song. Lyrics, sound sample. Give to God generously. God hears those who pray in need. CH763 / MV193 God bless to us our bread (Traditional Argentinian) A lovely simple grace for meals and for communion. More Voices has Spanish and French lyrics as well as English. "God bless to us our bread, and give bread to all those who are hungry, and hunger for justice to those who are fed. God bless to us our bread". This would be very appropriate if you are celebrating communion this week. Sound sample. Good for kids. Come on God, listen to us, we know you're here! *MV119 God our protector (Bell) Simple chant "God our protector, keep us in mind, always give strength to your people. For if we could be with you one day in time it is better than a thousand without you" Could be used between a reading of the Psalm, or on its own with or without an instrumental bridge, and I think it would be good for kids. *Linnea Good God you are for us the shining sun (Good) A simple refrain for this psalm. G(II)72 / GC77 Happy Are They (Porter) A simple refrain with cantored (or read) verses. The refrain also works as a round. "Happy are they who dwell in your house, O Lord". Sound sample. Sheet music. The refrain on its own would be good for kids. *Beneath the Noise How lovely is your dwelling place (Randall) A lovely contemplative settign of this Psalm. The congregation could join on the refrain while a soloist sings the verses. Note to BUC: I have this book, published by Creative Ministries Network in St Kilda. MV029 / PfAS084B How Lovely Is Your Dwelling Place / Better is one day (Redman) Recorded by Chris Tomlin. A contemporary praise and worship song. I don't actually like the recording much, but the song would work well for more contemporary congregations with a band, or if you have an excellent contemporary pianist. The sheet music listed for the song doesn't include all the stuff at the end of the Chris Tomlin recording which is not in the Psalm. MV092 Like a Rock (Good) A lovely simple song (with actions!) from Linnea Good. Great for kids. Tune in The God that I Know (Anderson) A beautiful ballad with female and male images of a loving, embracing God. “He comes with his arms open wide, a sheltering place I can hide”. If this is not familiar to your congregation it would be a good song for a soloist. Sound sample, sheet music sample and songbook. TiS 411 / AHB 328 / NCH266 / UMH537 / VU194 / A&M633 / CP658 / CP(E) 425 / W&R331 Filled with the Spirit's power Excellent inclusive words to a very well known hymn tune. I prefer it sung to WOODLANDS. New words to old tunes Lyrics and hymn tune samples. Worldmaking.net Brother Jesus right beside me (Bruxvoort-Colligan) This is a great rock song, good for little kids and a favourite of much older kids too. Lyrics and a very silly sound sample that IMHO does no justice to the song at all. We really rock it. Great for kids! CH570 / UMH512 / W&R495 / Cha629 / ZSS164 When the storms of life are raging (stand by me) (Tindley) A good gospel song. It also fits very well with the Goliath reading "Lord, who never lost a battle, stand by me". Hymnals have a range of translations. Sound sample and lyrics. We sing it pretty upbeat. I am going to suggest this song for next week's gospel reading as well, so it might be worth teaching this week! Good for kids (unless you sing it like Elvis). The proud pharisee and the humble and contrite tax collector. A Kyrie would also fit very well with this reading. TiS 681 Lord let me see see more and more (Langmead) An excellent song - kind of long with 5 verses, but very simple lyrics on some quite tricky themes. The tune is very natural to sing as well. Lyrics. MV127 I saw the rich ones (Mayberry) This is simple to sing and a great song for kids “But with God the world is turned upside down. The poor are embraced and the lost they are found. Let’s work for a world where all people are free. Where it’s good to feel good about God loving you and me”. Good for kids. TiS 728 Jesuchristo Reina reina ya! A fun Latin American song. It's particularly fun if someone is brave enough to yell out a "call" at the start of each verse. Good for kids. GtG794 / PH390 O Savior in This Quiet Place (Pratt Green) Honest, open words of coming to God in prayer. Traditional, and simple hymn tune. Liturgy for the Whole Church p174 The tax collector and the pharisee (Bock) A dramatic reading for two people. can humbly walk your way. and plant your wildest dreams.